ATLANTIC BEACH, Fla. – The Coast Guard and a commercial salvage company assisted seven people who became stranded on a grounded boat that began taking on water in Ponce Inlet, Florida, Thursday morning. A boatcrew from Coast Guard Station Ponce De Leon Inlet brought four of the seven adults aboard the Coast Guard vessel, and a commercial salvage boat picked up the three remaining people and took them to Lighthouse Boatyard and Marina in Ponce Inlet. A Coast Guard boat crew from Station Ponce De Leon Inlet, Fla., arrives at the scene of an accident involving a 53-foot boat that ran aground on Disappearing Island Thursday, May 29, 2014. At 7:14 a.m. a good Samaritan reported to watchstanders in the Coast Guard Sector Jacksonville command center the 53-foot boat, Big Buddy, was hard aground on Disappearing Island. 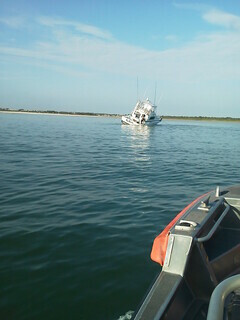 The vessel also began flooding as the tide started to come in. The watchstanders immediately began broadcasting a radio call, asking nearby boaters to assist, and directed the launch of the boatcrew from Station Ponce De Leon Inlet. The owner of the vessel hired a commercial salvage company and is currently working with the company to devise a salvage plan for the boat. The Coast Guard urges all boaters to use nautical charts, aids to navigation and the local notice to mariners and to familiarize themselves with the areas where they plan to operate a vessel.